Why do we live where we live? This question is posed by two new exhibits in the Woolworth windows – “Radiance” by photographer Kristin Giordano, and Wayzgoose 2014 by a herd of creative Tacoma printmakers. Giordano’s project focuses on Radiance, a (disturbingly) sunny suburban housing development in Fife. Wayzgoose artists, who created a slew of exuberant black-and-white prints that celebrate Tacoma, ask a different question – Why live anywhere else? 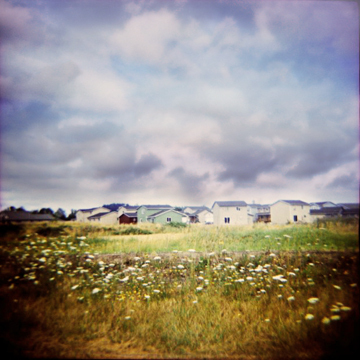 Giordano’s series of soft-focus photographs capture a suburban landscape whose neutral surface is pathologically clean, unscratched, and may, she seems to suggest, conceal strange dramas along placid streets. Giordano’s previous work includes portraits of deteriorating palaces in Qatar, and dream-like images of debris washed ashore on the Washington coast from the Fukushima nuclear disaster. With “Radiance” she isolates another unique moment in time and place. An Audra Laymon print and the inky linoleum slab it was cut from. Wayzgoose is a local tradition whose origins harken back to the printmaking guilds of the Middle Ages. There’s no way a little stormy “shrain” could dampen its 10th anniversary blowout in April! “It was definitely the worst weather in my recollection” with the exception of one year when tents were required, says stalwart founder, Jessica Spring. 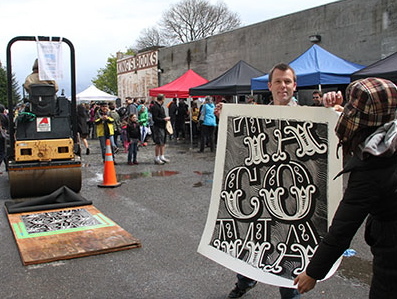 “The shrain (sun and rain) let up enough for us to get prints done, but the steamroller drivers, especially, froze.” A steamroller was used to make the 4′ linocut prints that are the trademark of this proud event. 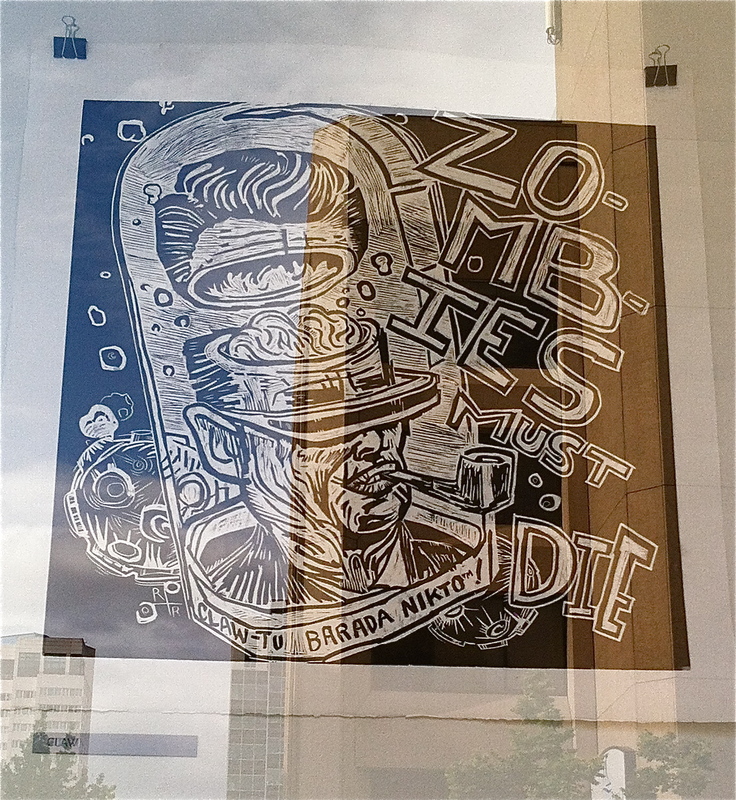 The fruits of that freezing day are now on view at the Woolworth Windows through August 21. 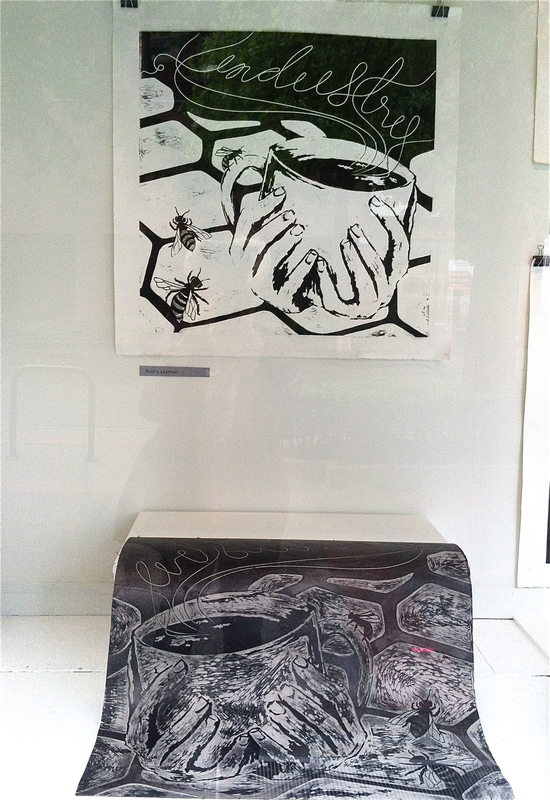 The black-and-white images are by area printmakers and students from Stadium High School, Charles Wright Academy, Pacific Lutheran University and the University of Puget Sound. Each print takes about 50 hours to make, says Spring. 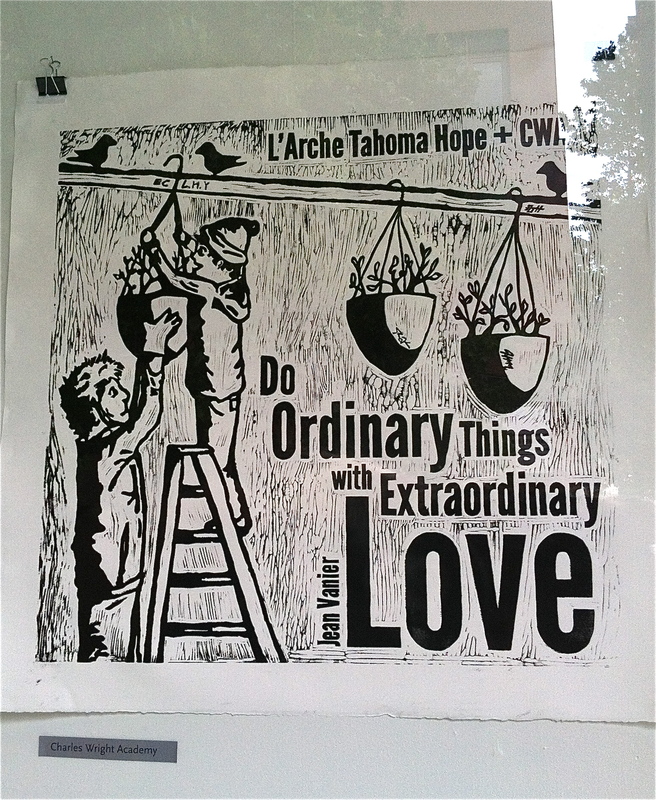 A print quoting l’Arche founder Jean Vanier by students at Charles Wright Academy. The South Sound boasts a robust community of printers and the popular event continues to grow in numbers of both participants and visitors. “I would say we had about 1,300 people throughout the day….Last year was about 1000,” says sweet pea Flaherty, owner of King’s Books and co-organizer of Wayzgoose. “Those are my completely unscientific numbers. I also think we had more students, middle school through college, this year than ever before.” In addition to the main event, King’s Books set up 30 indoor tables displaying the work of local paper artists, as well as hands-on activities. The Woolworth exhibit includes a number of process photos to “explain how the monster prints happen for folks who’ve never attended,” says Spring. Also featured is a lush, fantastical accordion book of paintings created by Jeremy Gregory and Geoff Weeg.